MAKE 4 HALF SQUARE TRIANGLES. THIS WILL CONSTITUTE ONE BLOCK BUT DON’T SEW THEM TOGETHER. WHOEVER WINS THE BLOCKS CAN ARRANGE THEM THE WAY SHE WANTS TO. IF YOU MAKE 8 HALF SQUARE TRIANGLES IT WILL MEAN 2 CHANCES TO WIN, 12 WILL BE 3, ETC. CUT TWO 5″ SQUARES OF WHITE AND TWO SQUARES OF TWO OTHER FABRICS. DON’T USE ONE WITH A LOT OF WHITE OR EXTREMELY PALE COLOR IN THE BACKGROUND. IT BLENDS WITH THE WHITE AND YOU’LL LOSE YOUR PATTERN. PLACE RIGHT SIDES TOGETHER AND DRAW A DIAGONAL LINE ACROSS THE CENTER. SEW 1/4″ AWAY FROM EACH SIDE OF THE LINE. CUT APART ON THE DRAWN LINE. SQUARE IT UP TO 4 1/2″. 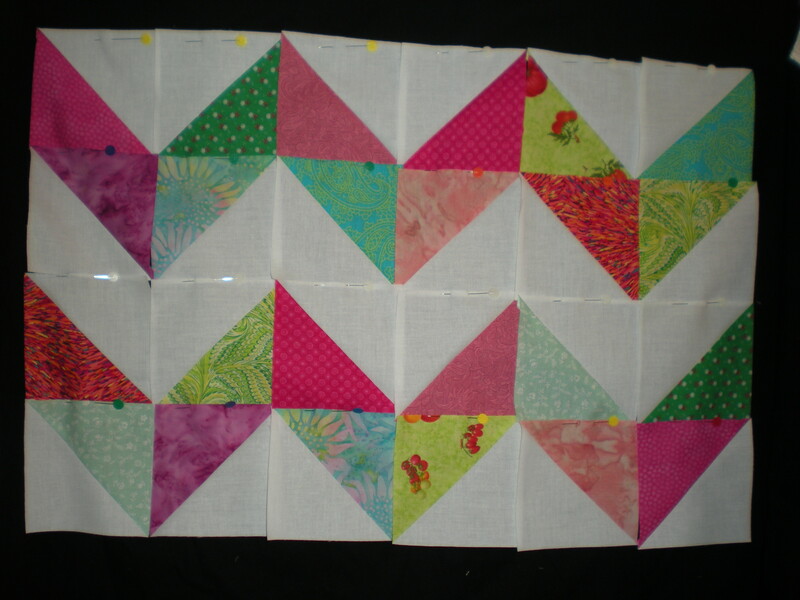 IF YOU PREFER TO MAKE EACH HALF SQUARE TRIANGLE INDIVIDUALLY TO MAKE BETTER USE OF YOUR SMALL SCRAPS THAT IS OK TOO. HERE IS AN EXAMPLE OF A WAY THE SQUARES CAN BE PUT TOGETHER.